Danielle Valley takes 3rd in the 400 IM with a 4:08.33 - a school record. Valley's 400 IM time takes down the second oldest record in the book - Bethany Pendleton's 4:08.92 from 2004. After the 400 IM, the Badgers still sit in second behind Indiana with 477 points. In the 200 free C-final, Maddi Tew is in the water. Maddi Tew finishes third with a 1:48.22 in the 200 free C-final. Three Badgers in the B-final for the 200 free: @ckinneyy , @abbyswim96 , and @esehmn22 . We have a winner in the 200 free B-final! @abbyswim96 goes 1:45.70 to take the win, while @esehmn22 takes 4th and @ckinneyy takes 7th. In the A-final, @CierraRunge is ready to go, taking on Haughey and Ryan of Michigan and Goss of Indiana. Second place for @CierraRunge in the 200 free with a 1:43.78 in a nail biter. Badgers still running second to Indiana with 550 points. Next Badger up will be Marissa Berg in the 100 breaststroke B-final. The boys are back in town. 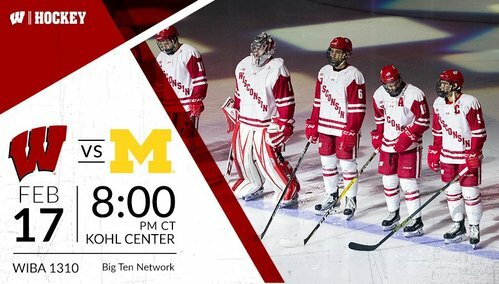 Don't forget to "White Out" the Kohl Center and wear white attire to the game. Berg on the blocks now. Marissa Berg places third in the 100 breast B-final with a 1:01.27. Maria Carlson is getting ready to chase Ashley Wanland's school record in the 100 breast A-final. Was within 2 tenths of a second in the am. Maria Carlson goes 1:00.36 for 6th place in the 100 breast A-final. Next up for UW is @beatagurl and @JessUnicomb in the 100 back A-final. After the 100 breaststroke, Michigan overtakes Wisconsin for second place behind Indiana. The Badgers sit third with 598 points. TWO Badgers on the blocks - @beatagurl and @JessUnicomb . Nelson is chasing Maggie Meyer's school record from 2010 tonight. Beata Nelson takes third in the 100 backstroke with a 52.18. After the 100 back, Badgers stay stagnant in third. Switching over to hockey coverage for the night - we will update with relay results and team standings during intermission. 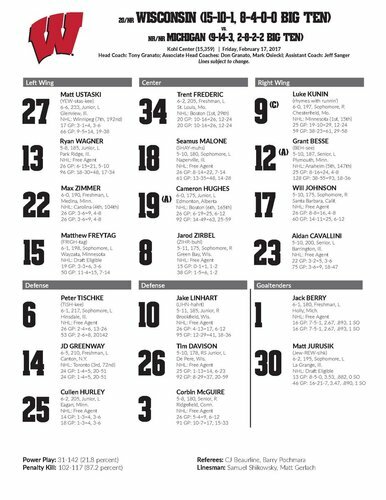 Here's our lines tonight as we are less than 30 minutes from puck drop in Madison. Hello #Badgers fans. I'm @B_Ehrlich11 & I'll be working the Twitter machine tonight. I'll try not to make any Spicer jokes, but no promises. 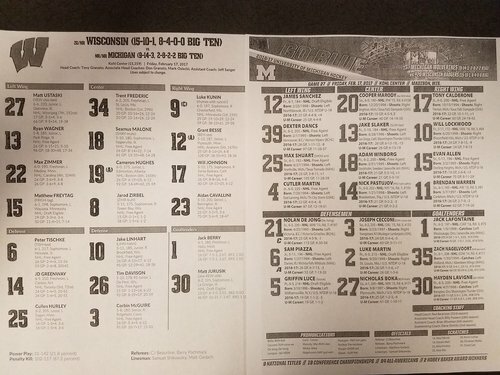 In other B10 hockey news, Minnesota leads Penn State 4-3 with under four to play, which is not great for Wisconsin's conference title hopes. 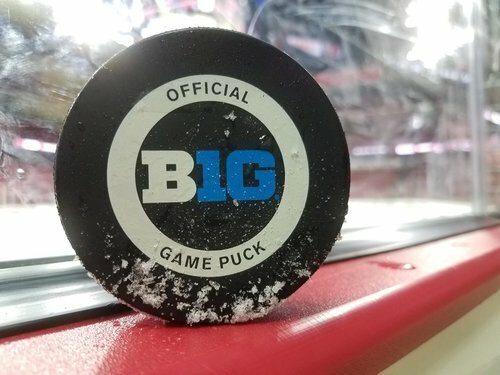 Minnesota extends its lead in the @B1GHockey standings to six points, pending the UW-Michigan outcome, with a 6-3 victory at Penn State. Minnesota defeats Penn State, meaning UW will have to win tonight to stay within three points. 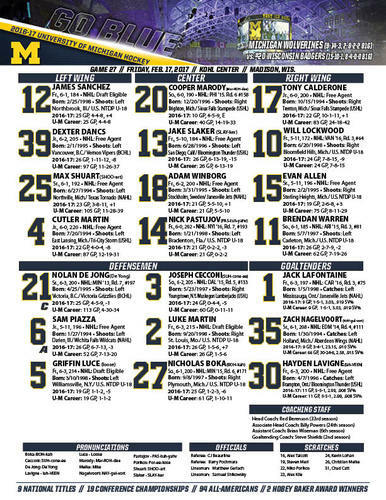 Jack LaFontaine in goal for Michigan tonight. Jack Berry for the #Badgers . 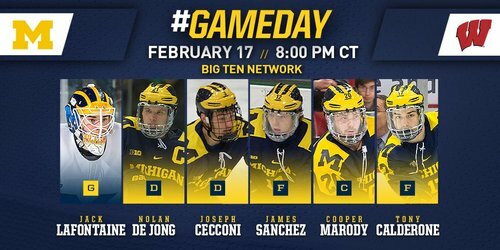 The 〽️ top line tonight as we are set to get underway at Wisconsin. 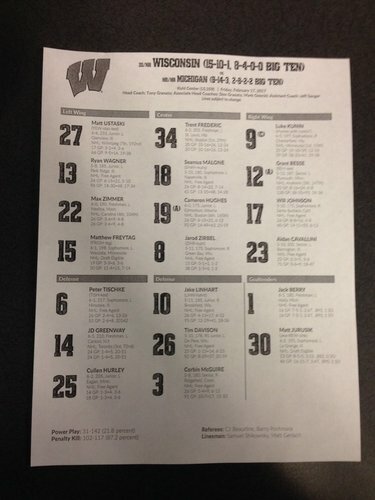 Second line and second D-pair gets the start for the Badgers tonight. Puck drop just a few minutes away. 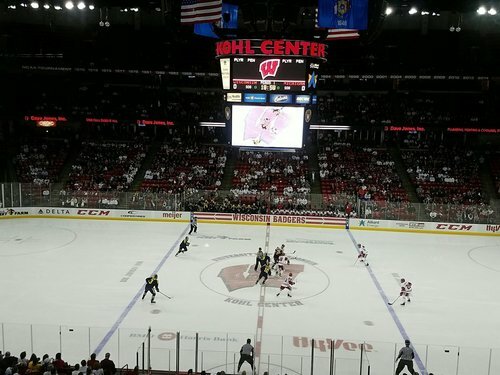 And we are underway at the Kohl. Not too many people here to witness the Badgers tonight. Berry swallows a non-dangerous shot from the middle of the ice. Quick thanks to Bruce Kiesling for his work over the years with the #Badgers stat crew. You will be missed.